I got a lot of questions about my Angry Bird Cake Pops, so here is little How-To for everyone. With help from my 5 year old daughter, we made some Red and Blue Angry Birds. First, gather your accessories. This will make it easier as you are dipping the pops. I used different eyes on each of the birds, but for this demo, I just grabbed the most abundant resource I had – sugar pearls. 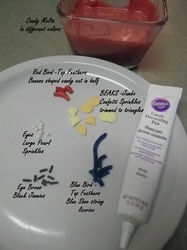 For the four different sets of eyes I used the following: Red – cut off ends of white Mike & Ike candies; Blue – Wilton Candy Eyes; White – Sugar Pearls; Yellow – White confetti sprinkles. We made the red bird first. I dipped the cake pop then carefully added the red banana candy halves to the top of the pop. The blue guy had blue shoestring licorice and the yellow and white guy had black jimmies sticking out of their head. 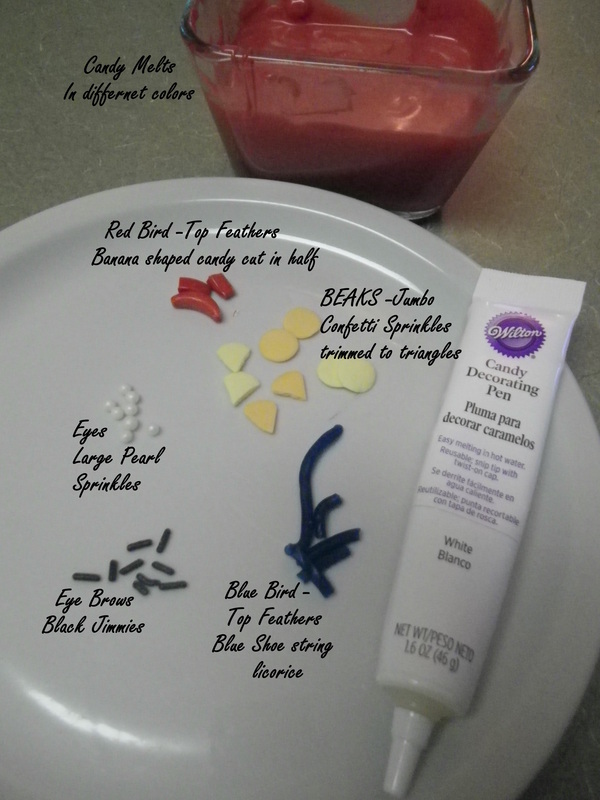 While the pop is still wet, we added the sugar pearls as eyes and the cut down jumbo sprinkles for the beak. Because the pearls are so small, use a tweezer, or do what I did, and just drop the pearl into place. You may need to hold the beak for a few seconds while the candy drys. 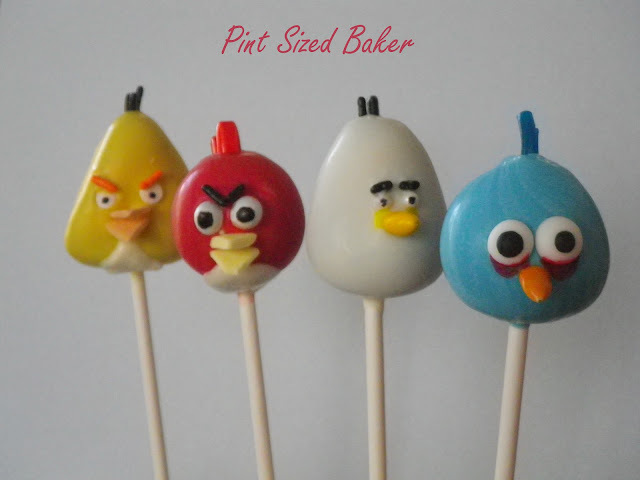 For the Yellow and white birds, I used yellow and orange colored chocolate covered sunflower seeds for the beaks. Add the MOST important detail : The Eyebrows! I carefully used a tweezer to add the black jimmies to the bird. 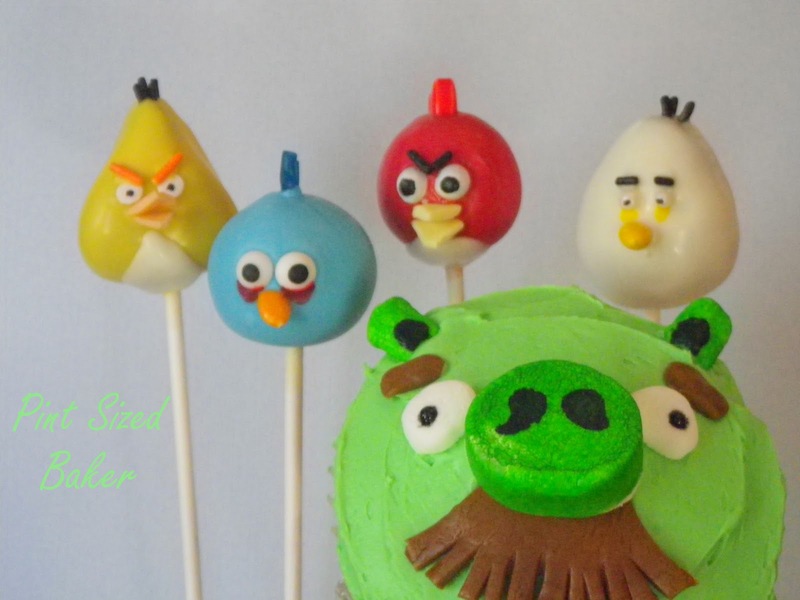 Refer to Angry Bird pictures on the internet for different looks. The yellow bird has orange brows and looks angry; the white bird has black brows and looks worried; the blue bird has no brows. 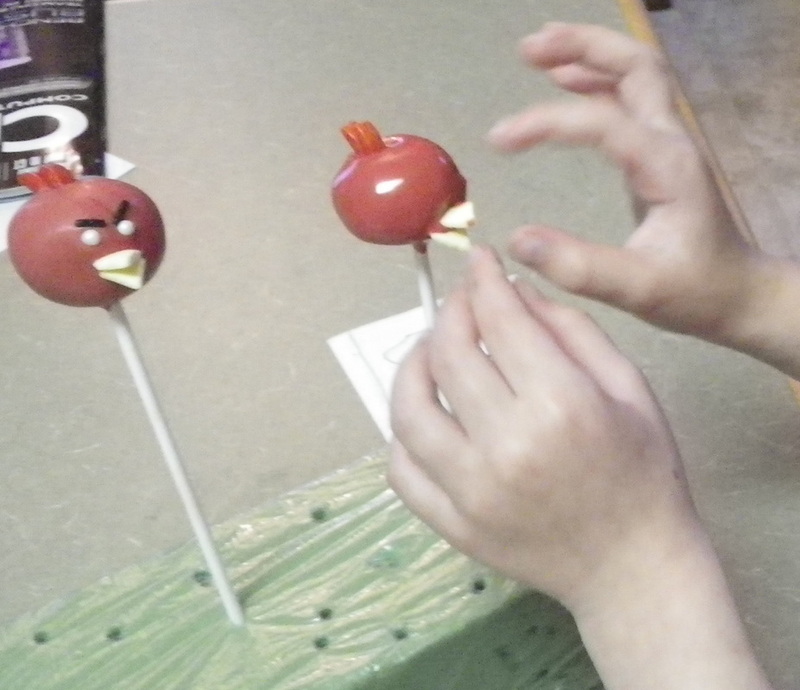 Once the birds were constructed (with help from little hands) we were ready to add the finishing touches. I used my edible Ink markers to fill in the pupils and add the red under the blue birds eyes. He looks as if he did not get any sleep for a few days. To complete the Red and Yellow Bird, I had to give them their white “shirts”. In the pictures they have a white underbellies, so I used my white Candy Decorating Pen to add the colored candy to their bellies. Don’t let the candy get too hot and drippy. Hold the bird upside down until the candy firms up before standing him back upright. And that’s it! Easy Peasy, Lemon Squeezy! Ok – maybe not so easy with the fine detailed work, but if my 5 year old can make them, so can you! Want to know about the darn pig? 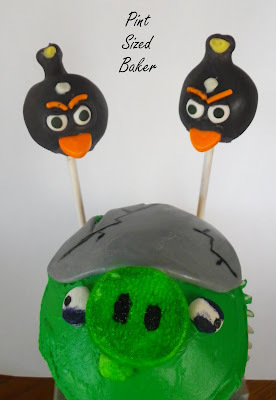 He was just a jumbo sized cupcake covered in green frosting and topped with two mini marshmallows colored green for ears; a large marshmallow also colored green and cut in half for the nose; mini marshmallow eyes cut in half; and a tootsie roll flattened and shaped for the the mustache and eyebrows. As I said… Easy! 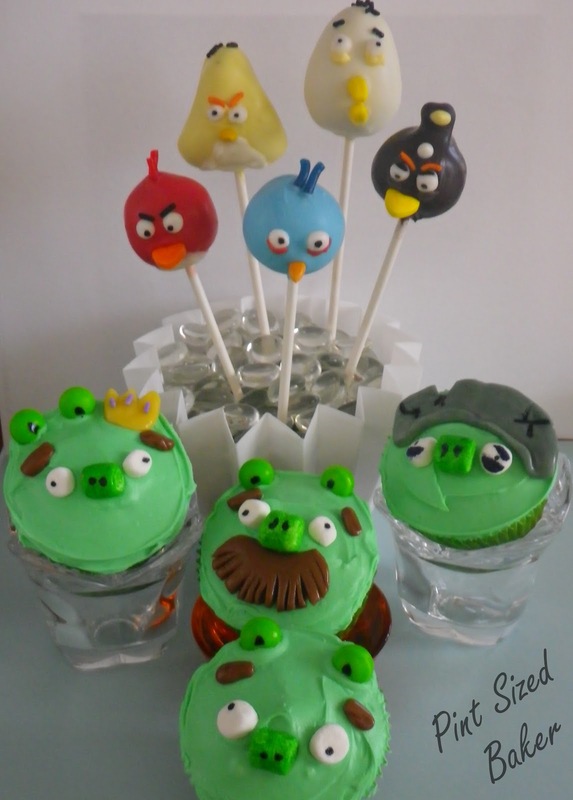 Have fun making your own Angry Birds!